A compulsory purchase order (CPO) is to be issued to the owner of a Hull cinema bombed during World War Two who failed to repair the derelict building. The National Picture Theatre on Beverley Road was hit during a raid on the nearby docks in March 1941 and has since remained derelict. A repair notice was issued to owner Hakim Saleem in December 2013. Hull City Council said it was issuing the CPO to "kick-start regeneration works" on Beverley Road. 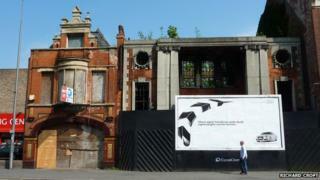 Campaigners want to restore the Grade II listed building in memory of the civilians killed in the Blitz. Council leader Stephen Brady said: "The planning committee took the necessary action in order to improve the listed building and in turn the surrounding area. "We don't want to hold back the revival of this key route into the city and the council will only use its CPO powers as a last resort. "But it remains our preference to try and reach an earlier agreement with the affected parties wherever possible." A spokesperson for the local authority said it had not set a date for when the CPO would be issued. The council agreed in principle to buy the former cinema after the building failed to sell at auction last May. The National Civilian World War Two Memorial Trust has fought a long-running campaign to redevelop the site. Trust chair Alan Canvess said: "We're very pleased that things look as though they're moving forward." More than 150 people were in the cinema on the night it was bombed, but no-one was killed or seriously injured.